MORGANTOWN, W.Va. — At first glance, the exam rooms are identical to what you would see in any typical hospital. Equipment is set up in the same fashion. Monitors display what appears to be actual patient data. The staff is dressed in hospital scrubs, and the hallways are bustling with activity and commotion. It isn’t until you look more closely at the patient’s bed that you realize it’s not actually a person who is being treated. Rather, it’s a manikin – a model of the human body used for teaching anatomy, demonstrating surgical operations, practicing cardiopulmonary resuscitation (CPR) and automated external defibrillator (AED) use, and even delivering a baby. The future for clinical education just became a little brighter for West Virginia University health sciences students due to the generosity of David Shaw and Jo Ann Goldbaugh Shaw, a retired pharmacist and physician and alumni of the Schools of Pharmacy and Medicine. 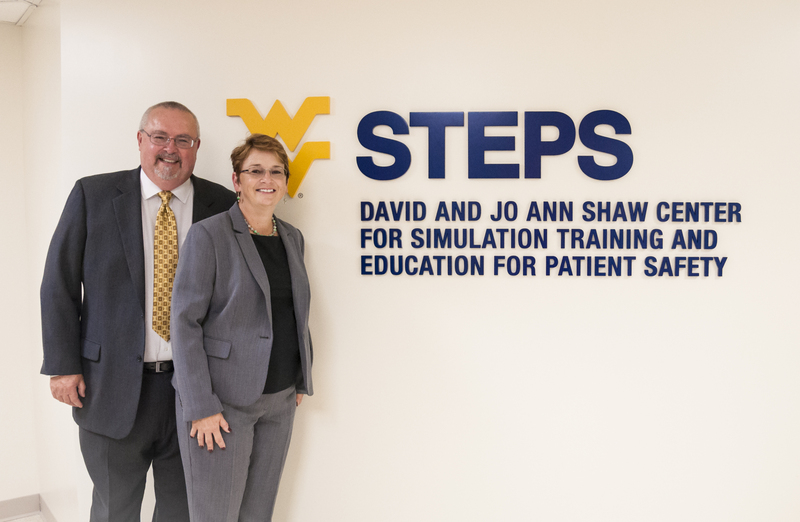 The Shaws, from Wheeling, W.Va., dedicated a substantial financial gift to the School of Medicine that helped support a recent $5 million expansion of the WV STEPS David and Jo Ann Shaw Center for Simulation Training and Education for Patient Safety. 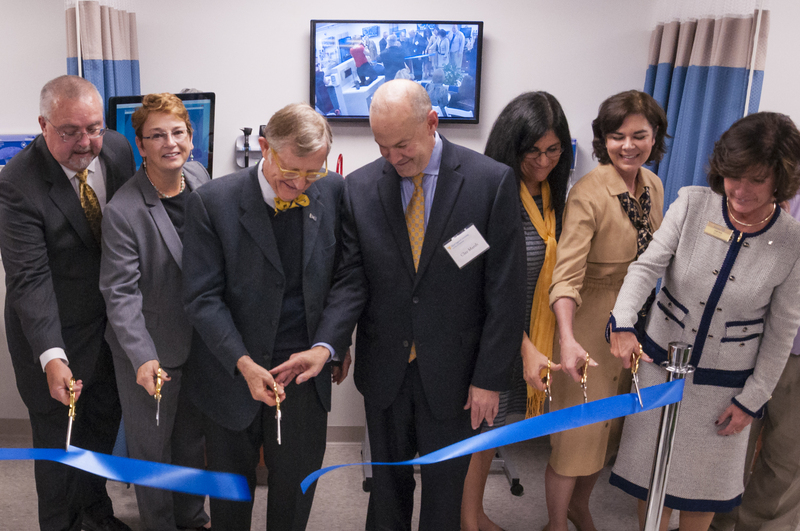 A dedication ceremony and official ribbon-cutting were held Oct. 9 at the WVU Health Sciences Center, where President E. Gordon Gee, Health Sciences Vice President and Executive Dean Clay Marsh, M.D., and other dignitaries gathered to speak and commemorate the moment. Guests were invited to tour the WV STEPS Center and participate in simulation activities following the dedication ceremony. “With their generosity, the Shaws are helping WVU to train competent, highly competitive health sciences students that are prepared to take care of West Virginians and others in their future healthcare careers,” Dr. Marsh said. 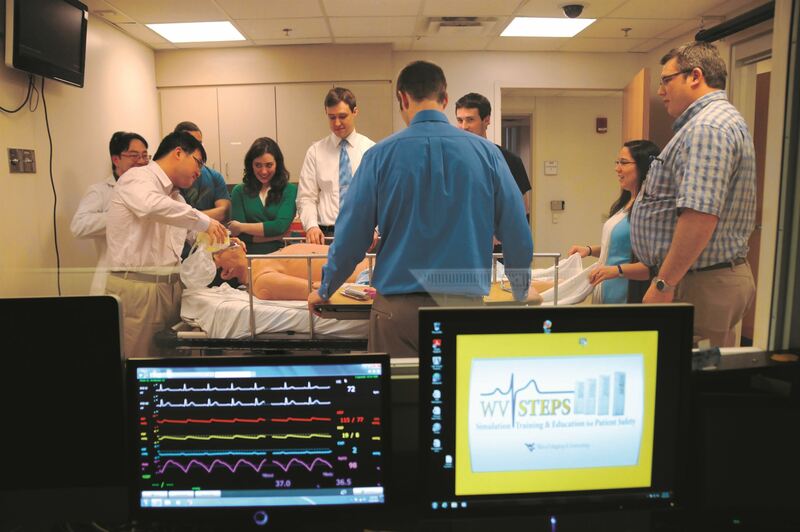 WV STEPS Center is an inter-professional healthcare training laboratory that provides students and clinical learners with hands-on access to patient simulators capable of everything from trembling and crying, to bleeding and giving birth. 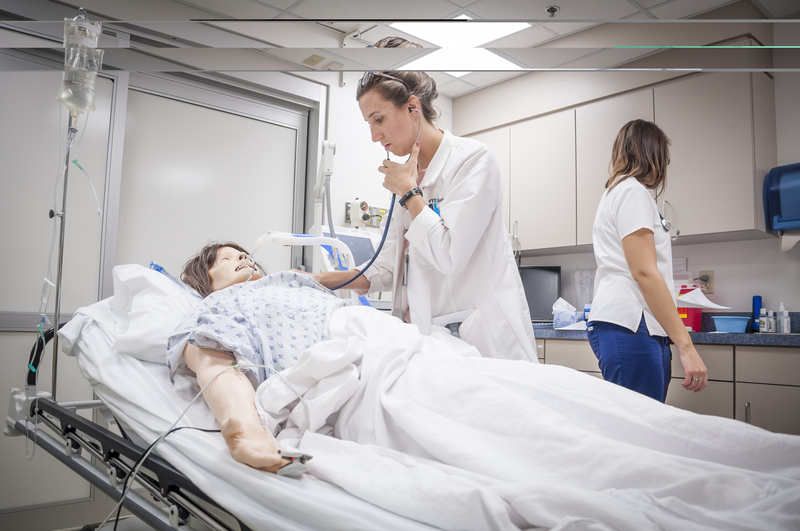 Using advanced technology, the Simulation Center helps clinical learners improve their analytical, diagnostic, communications, and crisis-intervention skills. The Shaws' gift enabled the WV STEPS Center to expand its footprint, nearly quadrupling the educational space within the Health Sciences Center; improve computer-based systems; open a fifth simulation laboratory dedicated to “mothers and babies” that is equipped to simulate the obstetrical environment; and enhance programs, such as the Standardized Patient and the Clinical Skills program where individuals are trained to portray a patient simulating a clinical condition. The gift from the Shaws was made in conjunction with A State of Minds: The Campaign for West Virginia’s University. The $1 billion comprehensive campaign being conducted by the WVU Foundation on behalf of the University runs through December 2017, partnering individual, corporate and Foundation support with the vision of better health and advanced care.